Has your water heater somehow seized control of the plumbing, and is only sending hot water into the piping? That doesn’t make any sense because there are separate hot and cold water lines. Has hot water been sent into the cold water line going to the shower? Eh, not likely. And by this point you’ve probably noticed that other taps in the house don’t have this problem. Something is wrong with the shower plumbing, not the water heater. But what’s wrong with the shower plumbing? The most probable cause is a defective pressure balancing valve. 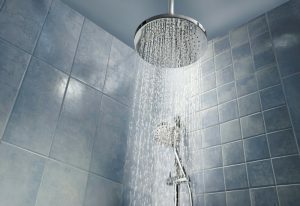 This is a valve, often located in the faucet of the shower, that regulates the pressure and ratio of cold and hot water flowing from the showerhead. It’s what mixes the water coming from the hot water and cold water lines to provide the water temperature you want for your shower. Like any mechanical component, the pressure balancing valve wears down over time. It’s also exposed constantly to water, making corrosion a possibility. Corrosion is more likely when the faucet isn’t used often, so you might expect this “nothing but hot water” problem to occur in a guest bedroom. We don’t recommend you grab some tools and attempt to open up the faucet on the shower to see if you can replace the pressure balancing valve. This can result in a scene from a silly comedy where water starts blasting out through the bathroom. This might be funny on a movie screen or TV; in reality, the amount of water damage can be staggering. We recommend you call a plumber in South Burlington, VT to come to the rescue. It’s a good general rule to call a licensed professional plumber for any plumbing job that makes you a bit nervous. It’s right to be nervous about most plumbing jobs, because you shouldn’t be taking them on yourself. A plumber removes the stress and gets the work done right the first time. A plumber can also do it quicker so you can have your shower back again. Plumbers will take care of the job of opening the shower faucet and removing the cartridge containing the pressure balancing valve. This is the most difficult part of the repair. The plumber will have the right replacement part ready to go after the old one is removed, and use top tools to have the new cartridge put in and hooked up correctly. It should be a quick job: this is an ambitious and tricky task for a homeowner to try as a DIY project, but for our professional plumbers it’s basic and we’ve done it many, many times before. Red Rock Mechanical, LLC serves Northwest Vermont and Northeast New York. Call us when you have plumbing emergencies, and we’ll be there!